Sitting here at a Google Bootcamp on Advanced Search Advertising (it’s our lunch break), I keep hearing the other people attending, telling story after story about how their clients tried to manage Google Ads their own and made a complete mess of it. I can understand the attraction of managing your own Google Ads account. Google encourages it with their AdWords Express offer that pops up with every Google service you sign up to. There are so many “fly-by-night” companies offering it to you from countries half way around the world at seemingly cheap rates. These same companies all claim to be “experts” in Ads campaigns. Yellow Pages have sale reps selling Google Ads every time you want to talk about how expensive their adverts are. It is hard to know who you can trust and at least if you manage your internet marketing yourself, you’re the one in control. I Can Manage Google Ads Myself! Yes you can. You can create an account and set up an advert that will be running in no time at all. Your business will appear on Google searches and websites all over the country… maybe even the World! You can get found for thousands of different keywords, people will flood to your website and the money will fall from the sky like a gift from the Google Gods! Maybe. If you choose to manage Google Ads yourself, it is easy to get started but it is virtually impossible for a novice user to know whether or not they are getting the best results possible. It’s like Dr. Phil says; “You don’t know what you don’t know”. Here are some examples of how things can go wrong if you manage your internet marketing yourself – and some where the companies shown should know better. Here’s an example of being found for something that you really don’t want to be. 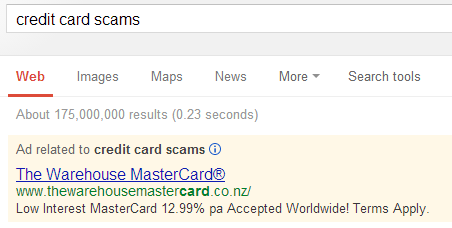 This image shows an advert for The Warehouse MasterCard offer but in relation to “credit card scams”. Oops! Having your advert appear for searches like this not only gives the wrong impression but is also negatively affecting the performance of your advert for keywords you do want to show up for. This is an example of poorly managed Google Ads where the person creating the advert did not define the geographic locations that they want the advert to appear. 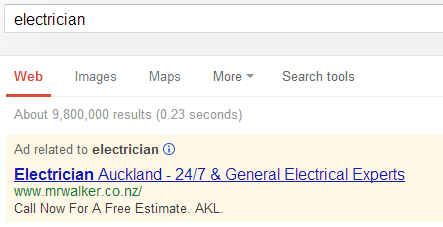 This search was for an electrician with Google’s search location set to “Whangarei”. This particular electrician will have clicks from all over the country that will be a waste of money because he’s servicing Auckland only. This search for “weight lifting” is a good example of poorly thought out keywords. Most of the results were for gyms and sports supplements but this one showed for commercial and industrial scales. My guess is that someone set it up to display for any search using “weight”. If that’s the case, they could be showing for searches about “weight loss” or other synonyms. If you’re going to manage Ads yourself, get the keywords right! 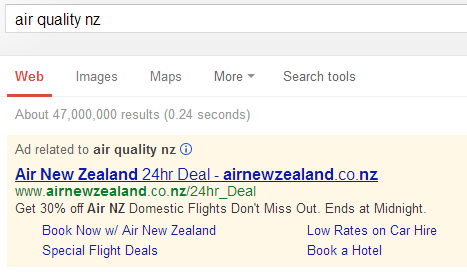 Air New Zealand must have a massive budget for online advertising, so I thought I would test them out. I was able to make their adverts appear for “air quality nz”, “air disasters nz” and “hot air ballooning in nz”. None of these searches are of any use to them so any click would be wasted money. It looks like their advert was set to appear for almost anything that contained “Air” and “NZ”. However, I checked again a couple of days later and they weren’t showing so perhaps they are onto me! 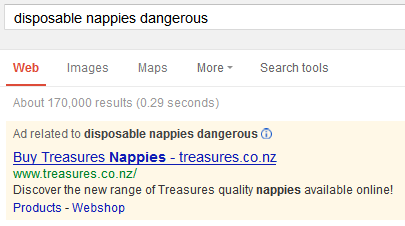 Treasures Nappies are a brand that is well recognised but why would they want to be associated with a search for “disposable nappies dangerous”?! This is something that catches out a lot of advertises who manage Google Ads themselves. If you don’t consider all the alternative searches that may display your adverts, you may be paying for worthless clicks. Other examples that might being up your adverts where you might not want to are; reviews, examples, photos, jokes, jobs or bad. The “bad” keyword is a great example. Try a Google Search for “Bad Painters in [insert your town]” and see how many tradesmen are paying to advertising themselves as a “bad painter”! There are some things I don’t do myself because I don’t have the time, resources or expertise to do them as well as I need them done. Strangely, when it comes to internet marketing, everyone considers themselves competent enough to do it all on their own! They build their own website, do their own SEO and manage Google Ads themselves too. Months down the track, they give up in frustration and ask for help. The trouble is that on the internet, some things last a long time. A website that has been penalised by Google or damaging SEO practices can takes month (or more) to put right. If you’ve tried to manage Google Ads yourself, you could also have done some lasting damage that will take time to put right. If you’re spending a ton of money on Google Ads but not getting results, or worse, have no idea if you’re getting results – stop now. 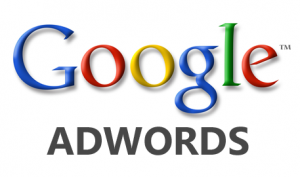 Contact us for a free consultation to manage Google Ads for you.